The Philadelphia Eagles were 7-1 as they faced the New York Giants in the second of back-to-back games between the clubs on November 27, 1960 that would effectively determine the winner of the NFL Eastern Conference. Coached by Buck Shaw, Philadelphia was an overachieving team. 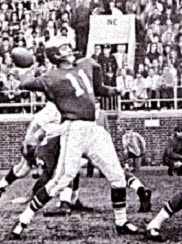 QB Norm Van Brocklin was the undisputed leader of the offense and had reliable receivers in flanker Tommy McDonald and ends Pete Retzlaff and Bobby Walston, who was also the placekicker. When FB Clarence Peaks went down with a season-ending broken leg, rookie Ted Dean (pictured above) stepped in admirably and when LB Bob Pellegrini likewise was lost to injury, center Chuck Bednarik returned to that role, playing both ways in doing so. Rookie LB Maxie Baughan and veteran safety Don Burroughs, obtained from the Rams, also helped to bolster a much-improved defense. In beating the Giants at Yankee Stadium the previous week, Bednarik had deprived New York of star HB Frank Gifford with a famously jolting tackle and now the 5-2-1 Giants, who topped the conference in each of the previous two seasons, were in a must-win situation. New York was also without veteran QB Charlie Conerly and relying on George Shaw to guide the offense. Still, under the direction of Head Coach Jim Lee Howell, this was a good veteran club with a sound defense and plenty of remaining capable players on offense. There were 60,547 fans in attendance at Franklin Field for the final showdown between the two rivals. The Giants struck quickly on their first play from scrimmage as George Shaw went long for end Kyle Rote, who went the distance for a 71-yard touchdown. Pat Summerall added the extra point. The Eagles turned the ball over when QB Norm Van Brocklin’s long bomb was intercepted by DHB Lindon Crow and New York scored again, this time driving 83 yards in eight plays. HB Ed Sutton ran around end for 34 yards on first down and HB Joe Morrison caught a pass for 17 yards and then rushed for 19 on the next play. Once again Shaw passed to Rote for a TD, this time from 11 yards out. Summerall’s conversion had the visitors up by 14-0. The teams exchanged punts before Van Brocklin threw a pass that was intercepted by LB Harland Svare near midfield and returned to the Philadelphia 18. However, the Giants lost yardage from there and end Bob Schnelker dropped a third-down pass in the end zone, but they added three more points with a 35-yard Summerall field goal. As the game headed into the second quarter, the Eagles had to punt and New York moved the ball effectively. However, safety Bobby Freeman intercepted a Shaw pass at the Philadelphia 44 and returned it all the way to the New York nine. The home team couldn’t reach the end zone from there, with a pass to Tommy McDonald in the end zone ruled out of bounds, but Bobby Walston kicked a 15-yard field goal to get the Eagles on the board. Once again the Eagles intercepted a Shaw pass, this time the culprit being Maxie Baughan to give them possession at the New York 26. Van Brocklin (pictured at left) threw to Ted Dean for a 25-yard touchdown and, with Walston’s point after, the New York lead was narrowed to 17-10. For the third time, Shaw was picked off, with Don Burroughs giving the Eagles the ball at the New York 33. Dean ran for 17 yards and Van Brocklin completed two passes to reach the six. From there, HB Billy Barnes ran to the one but fumbled, and OT J.D. Smith outmaneuvered two defenders to recover the ball in the end zone for a TD. Walston again converted and the score was tied at 17-17. With time running out in the first half, the Giants, who had been reeling through most of the period, advanced into Philadelphia territory. FB Mel Triplett and Sutton combined for 18 yards on the ground and then Shaw completed a pass to Rote for 35 yards. New York moved back on top with a 31-yard Summerall field goal and the score was 20-17 heading into halftime. Following a three-and-out series by the Eagles to start the third quarter, the Giants drove to the Philadelphia eight. Triplett and Morrison ran the ball well and Shaw tossed a pass to HB Alex Webster for 14 yards along the way. Summerall booted another field goal, this time from 15 yards, and the visitors were ahead by six points. Again the Eagles had to punt, and once more Burroughs intercepted a pass, this time putting the home team in possession at the New York 49 to start the fourth quarter. On the next play, Van Brocklin fired long for Dean, who gathered in the pass at the 15 and, helped along by a block by Pete Retzlaff, ran the rest of the way for a 49-yard touchdown. Walston’s extra point gave Philadelphia the lead by a 24-23 score. The Eagles forced another turnover on the next series when DE Joe Robb knocked the ball loose from Morrison and DHB Jimmy Carr recovered at the New York 30. Philadelphia again made the most of the opportunity, advancing 30 yards in eight plays. After converting a fourth-and-one play with Dean diving over the stacked defense for the necessary yard, Van Brocklin connected with Barnes for an eight-yard TD and, with Walston’s PAT, the Eagles were up by eight points. The teams each had short possessions and punted, and Lee Grosscup came in at quarterback for the Giants. While Grosscup completed two passes, a penalty and a sack by Chuck Bednarik negated the gains. The Giants attempted to convert a fourth-and-one play from their 36, but Triplett was stopped short and the Eagles were able to run out the clock to win by a score of 31-23. New York had the edge in total yards (337 to 211) and first downs (13 to 12). However, the Giants also turned the ball over five times, to three by Philadelphia, and that made the difference. Norm Van Brocklin completed 13 of 23 passes for 147 yards and three touchdowns, along with three interceptions. Ted Dean ran for just 28 yards on 11 carries but also caught 5 passes for 74 yards and two TDs. Billy Barnes gained 35 yards on 17 attempts but his lone pass reception was good for a touchdown. 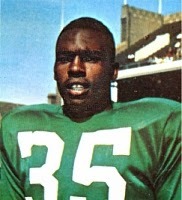 Tommy McDonald contributed three catches for 46 yards. On defense, Don Burroughs accounted for two of the interceptions. For the Giants, George Shaw was successful on 9 of 19 throws for 179 yards and two TDs, but gave up the four big interceptions. Kyle Rote (pictured at right) caught four passes for 124 yards and two touchdowns. Ed Sutton topped the club in rushing with 57 yards on five carries and Joe Morrison added 54 yards on 17 attempts. The win over the Giants was also Philadelphia’s last home game of the regular season, but the Eagles went 2-1 on the road to wrap up the Eastern Conference with a 10-2 record. They defeated Green Bay for the NFL Championship. New York dropped to third at 6-4-2. Norm Van Brocklin was a consensus MVP as well as All-NFL and Pro Bowl selection. He ranked second in pass attempts (284), completions (153), yards (2471), and TD passes (24) in what was his last year before moving to the sidelines as head coach of the expansion Minnesota Vikings. Ted Dean rushed for 304 yards, gained 281 more on 15 pass receptions, and adding in kick returns, accumulated 1120 total yards. He capped a promising rookie season by starring in the NFL Championship game, where he scored the game-winning touchdown. Kyle Rote had a solid season at age 32, catching 42 passes for 750 yards (17.9 avg.) and scoring a career-high 10 TDs.